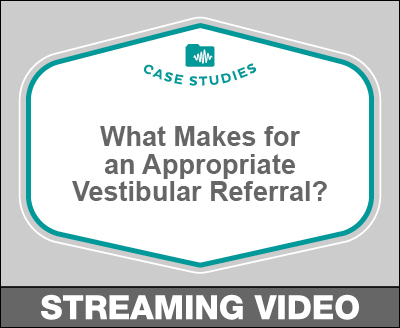 What Makes for an Appropriate Vestibular Referral? Audiologists are routinely on the receiving and giving end of referrals for vestibular evaluations. Typically, these referrals are grounded in clinical suspicion (case history) or preliminary clinical findings (e.g., bedside examination, asymmetric hearing loss, fluctuant low-frequency hearing loss, etc.). There are instances, however, when the clinical presentation is ambiguous, and sometimes a referral seems warranted despite clearly non-vestibular findings. This course will discuss what constitutes an appropriate referral, highlighting the importance of case history in determining whether vestibular testing is appropriate and what procedures should be considered.